We booked Warren to do some exterior painting at our home. A week later the job was done and we could not be happier with the result. Both Warren and Paul were very easy to deal with and extremely professional. I will definitely recommend Warren and Paul to friends and family and will absolutely call Warren again for any other painting projects I have. I would highly recommend Warren Gamey painting, he was professional, fast and did an excellent Job. he is a very knowledgeable painter and his crew was great to work with. Warren Gamey and his team are truly professional! I received a reasonable and accurate quote for work which was performed quickly and accurately. Clean-up was very thorough and I did not have to lift a finger. I would HIGHLY recommend the services of Warren Gamey Painting! This was the second time that we used Warren for painting in the church. Both times he came ASAP to give a quote, always came when he said he would and on time, he stuck to his quote, and did a wonderful job quickly! He and his crew were always friendly and respectful. The team from Warren Gamey Painting and Decorating gave my home-office a complete makeover in the space of one day! Work was performed to high standards and for the exact price quoted. 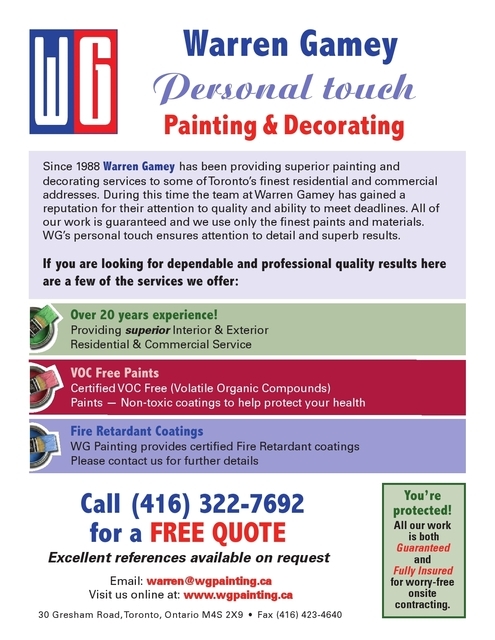 I would highly recommend the services of Warren Gamey Painting. Our real estate agent recommended Warren when we were getting our house ready to sell it. Warren was round almost immediately on a Sunday afternoon to give us an estimate and talk us through paint choices. That estimate was exactly what we paid when the job was done. The next Tuesday and Wednesday, Warren and his crew (Adam and Paul) either repainted or touched up every wall in our 1500sq ft home. And trust me, with two young and energetic boys in the house, it needed a lot of touching up. The guys were very fast, left no mess and were cheerful and friendly throughout. (Warren is incredibly enthusiastic and cheerful. I suspect it's all the espresso he drinks.) The quality of the work was very high: no brush marks, missed spots or drips on the baseboards/floor. I wouldn't hesitate to recommend Warren and we'll definitely be using him to redecorate our new house. WGP Painting, Warren is a man of his word! On time, On Schedule and on budget he is Fast, effective and Warren is a gentlemen as well as a good painter. It is a breath of fresh air to have some so reliable is Customer Service and Follow are A+.